This double page spread from Ben and Le-Anne's wedding album shows the really important photos of the groom and his best man immediately before the wedding. On the upper right image we see a photo of the bride and groom's wedding rings, placed together in the open hand of the best man in order to show the scale of each ring individually. The lower left image shows a more traditional portrait of the groom and the best man, which is a half length portrait. 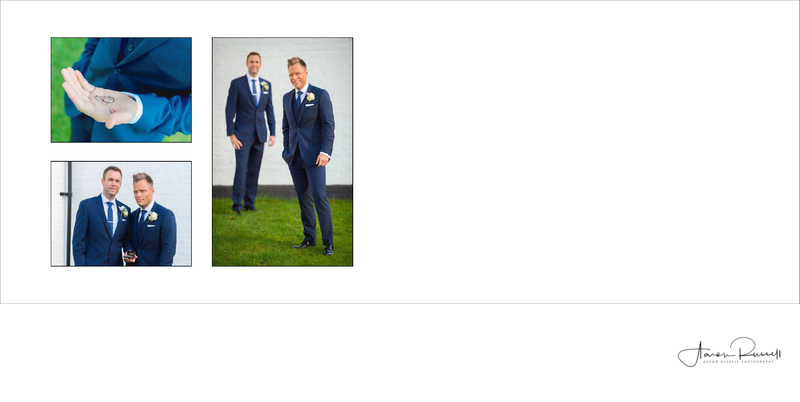 The image on the right of the left page shows a full length portrait of the groom and best man. In this instance, the groom was asked to stand in front of the best man and slightly to the side. This separation means that, using a wide aperture you can throw the best man slightly out of focus. This gives the effect of making the groom more prominent in the photo, which after all, as the groom he should be. He's the second most important person at the wedding, after the bride, naturally. My favourite lens for this type of photo is a lens of around 85mm on full frame and 110mm on my medium format camera.